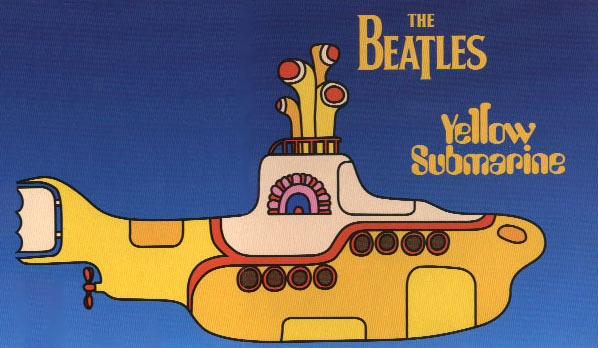 I'm not really a Beatles fan, but I couldn't resist the opportunity to be part of Beatles history as the movie, The Yellow Submarine, was re-released. 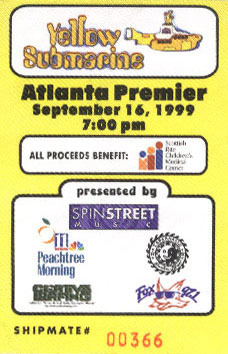 As part of a fund raiser for Scottish Rite Children's Medical Center, Spin Street record store put on a premiere party at the Tabernacle. How do you open a Beatles' movie? Why with a ventriloquist of course. Bob Abdou (aka Mr. Puppet), who frequently appears at Beatles festivals, opened the show with two acts. The first was a Ringo Starr interview and the second was a John Lennon concert while the puppeteer wore a black suit. It was very funny and entertaining. 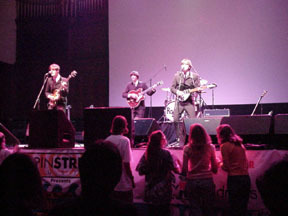 The second act was a Beatles look-a-like band called the Roaches, I from Athens, Georgia. The sang several Beatles songs and really drove the crowd wild. Several teenage girls actually rushed the stage just like in the news films from 25 years ago. Later, when the came out to sign autographs they were mobbed and I think it delayed the showing of the movie. It was really great to see so many different people having such a wonderful time. I was expecting more Beatles fanatics wearing costumes and all but didn't see any. There were a few hippies, but it was a real cross section of people from babies to gray haired elders: from punks to suits. The Beatles really did appeal to a wide audience and still do today. For the Roaches last song the passed out kazoos. Needless to say some of got really annoying with our obnoxiously loud playing. What is really funny is how many people thought they were broken because they didn't know how to play one. If you've never seen the movie on the big screen with stereo sound I really feel sorry for you. It was a great experience to see the images 20 feet tall and hear the music in booming stereo sound. It was really great. But, I guess watching it stoned, as they had intended, probably would have been fun too. Questions, comments, corrections always welcome.